Even after – especially after, you have seen the young salmon, their continued presence in these streams may strike you as utterly remarkable. Young salmon confront you with living proof of the reality and, yes, the endurance, of a life cycle so seemingly heroic as to appear mythical. The presence of one delicate little young salmon not only implies but indisputably confirms the ecstatic victory of all that has gone before: the struggles against death, the driving and striving for life, the unquestioning devotion to the future that brought their parents back from so far away. When it comes time, adult salmon that have ranged into the ocean as far as twenty-five hundred miles from the mouths of their birth rivers turn toward home for the first and final time. There is no equivocating; an adult salmon’s homeward migration is rapid and direct, averaging about thirty miles per day. Fish that have spread out over thousands of square oceanic miles converge with alacrity, arriving at their natal rivers within days of each other. Visibility in the sea is extremely limited, and the fish live and travel with no reference to visual markers-a tremendous disadvantage compared to, say, a migrating bird. Yet in its migrations a salmon can maintain homeward direction for mile after mile-though returning by a route it has never before traversed. It is traveling by means of extraordinary internal navigational systems that remain one of the most intriguing mysteries of animal migration. Aside from the hundred million bits of magnetite arrayed into chains in a salmon’s brain, the fish have revealed few of their navigational secrets. Scientists are still guessing. To accomplish its migrational feats a salmon must be able to form a “map sense”. Salmon are probably using the inclination and declination of the earth’s magnetic field, backed with a celestial compass, and then comparing a sense of how daylight varies with latitude against an internal annual clock containing rate of daylight change throughout the year. They must also be able to call up some sense of their position relative to the location of their home stream. However they are doing it, a salmon certainly knows where it is going. Homing rates are as high as 99 percent. Homing to the correct stream is important for salmon because different streams are continuously forming the fish for the best fit. Homing brings the keys back to the locks they are made for; it brings salmon back to the stream that suits it, rather than to one in which the waterfalls are too high, the gravel too coarse, the diseases too virulent, the water temperature too warm. Those streams have their own adapted fish. Yet when they arrive near the rivers of their birth and impending death they behave as if they may be having second thoughts, wandering erratically, drifting, moving toward and away from the river itself. Here, the whiff of odors from their childhood streams, suddenly familiar again, take the helm. Not only do salmon smell their way home, their olfactory sense is extraordinarily acute, allowing them to find tiny natal springs flowing into major rivers. 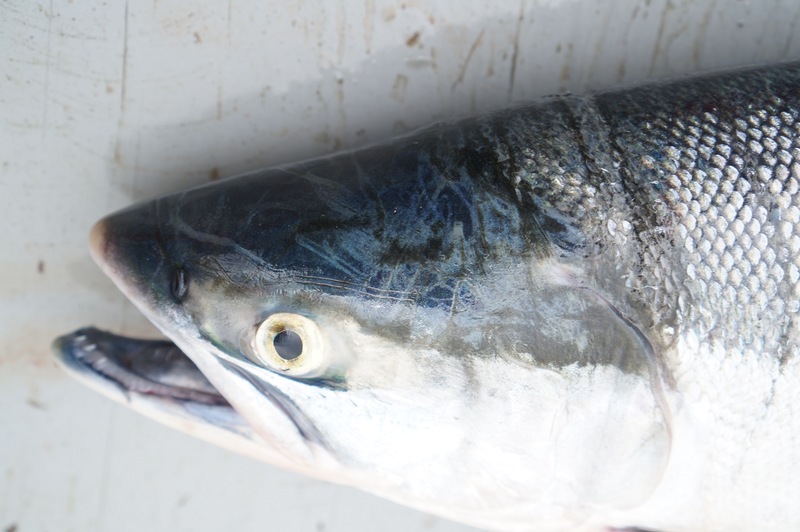 How the salmon that, as a youngster, transformed for life in the sea changes again for surviving freshwater. Accompanying this are changes to nuptial colors (including the spectacular coloration of breeding sockeyes, with their bright green heads and cherry-red bodies afire), the greatly enlarge teeth, the grotesque hooking go the males’ jaws for breeding combat, and the monumentally humped back of breeding male pink salmon. Once in the river, the fish must trick the current. In fast rivers, they must travel against water flowing more than half again as fast as the salmon’s fastest sustainable swimming speed. Choosing paths of least resistance, they use bends, irregularities in the bottom, rocks logs, and other objects that break up the flow or even produce eddies where pockets of water are flowing upstream. Salmon have usually ceased eating by the time they enter natal streams. They depend on energy reserves for maturation of sperm and eggs, migration upstream, spawning, and nest defense. This may seem unremarkable for those runs that breed within sight of the sea. But for those that must ascend rapids, leap waterfalls, climb nearly a mile above sea level into mountains, and – boring into the current at rates of about twenty miles per day without anything we would recognize as rest – penetrate a thousand miles into the continental interior (and in some cases then wait for months while fasting until river conditions are right for spawning), the feat approaches miraculous. It marks the extreme adaptive edge of the ability of a creature to endure. Yet they have flourished. But the toll involves extensive biochemical and physiological changes, immune-system failure, and total exhaustion of bodily reserves. in a sense, the fish becomes a delivery system for offspring, its fuel and infrastructure calculated to get it to the spawning grounds – and no further. Systems not needed for spawning are used to fuel the travel. The throat and digestive organs degenerate as the fish consumes its own body. Protein is broken down and metabolized until, by the time they are ready for spawning, their muscles are mush. But enough water replaces the burned-up tissue to keep the skin plumped and streamlined. All other things are sacrificed for one: In the male, that sperm is healthy and vigorous; and, inside the female, that eggs are well-endowed with nutrients to carry them through hatching, then months of early development. When, finally, the tributary of their own birth is attained and the time has come, they will seek out suitable gravel- clean and of the appropriate size- to dig their nests, called redds. The female turns on her side, presses her tail to the bottom, and with powerful flexes lifts sand, debris, and gravel into the current. Her vigorous digging is interspersed by periods of resting, while she evaluates her progress with her fins. her nest-making activities attract suitors. Other females, undesirable males, and potential predators of eggs, she drives away. The accepted male fights off other males, though some may continue to hover nearby. While the female continues to excavate, the male courts her with repeated touches – his snout to her flanks- and by crossing over her tail and then quivering his body against hers. Eventually the pair will lie side by side with their bellies close together near the bottom of the nest. They go through the motions several times, then their backs arch, bodies tilt to bring bellies closer, mouths gape open. Eggs and sperm gush forth. Satellite males often rush in, strafing with sperm, fertilizing enough eggs to perpetuate their behavior in the species’ repertoire. The female must soon cover the eggs, lest they be swept away Afterwards, she rests several hours. Over several days she will lay more eggs in the same redd, which may be fertilized by the same or another male. With laying completed and the redd fully covered the female will guard the eggs for as long as two weeks, driving off other salmon who might accidentally dislodge her nest, until her death. Males also often combat intruders near their nests, or they may continue courting until they become too weak to stem the current, and then they drift downstream. By the time a salmon is near death, its fins are frayed, its skin battered and broken, its body host to white fungus. Internally, its cardiovascular system, pituitary and adrenal glands, stomach, liver, and kidneys are degenerate and wrecked. The creatures is consumed and consummated. A time to live, a time to die. “The death of salmon,” wrote Roderick Haigh Brown in 1946, “is a great gesture of abundance.” Salmon bring the wealth of oceans – transformed into their own animate bodies – into mountain streams, feeding eagles, bears and their own children with their carcasses. When we eat a salmon – when we put its body into our own – we have allowed the fish to do the mysterious work of gathering the wide ocean’s sparse nutrients together for us in the form of their very flesh. The thin soup of the whole North Pacific ocean, strained and condensed into decadent muscle, is now delivered to the scavengers. Many there are. To the list headed by bears and eagles, add the insects that will feed the baby salmon that are incubating in the gravel. Add more than twenty species of birds and mammals: raven, dipper, jay, wren, shrew, skunk, raccoon, otter, bobcat – even squirrels and deer may nibble the cadaverous fish in search of some trace nutrients delivered from the deep and distant sea. The dead propel the living. Something like half of the carbon and nitrogen in stream insects, trout, and young salmon is of marine origin. In other words, much of the bodies of young salmon are composed of the resurrected bodies of their parents, the new salmon assembling themselves from the disassembled molecules of the old. One thing follows: The fewer adults that return (and the more that hatcheries insist upon removing and discarding carcasses), the fewer of their children the stream can support. If adult runs decline, the fertility of the stream declines. Its production potential drops, and ever downward spiral that can fall much faster than it can rebuild.